NEW FOR 2019! Our TurboBuicks.com Alternators are now 240AMPS! 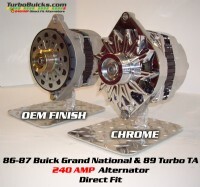 TurboBuicks.com now provides 240AMP alternators for the '86 - '87 Buick Grand National, Turbo-T, T-Type and 1989 Turbo Trans Am. NEW FOR 2019! 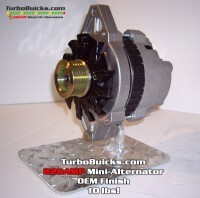 TurboBuicks.com Introduces 220AMP Mini-Alternators! 4lbs lighter than the stock 120AMP alternator! NEW FOR 2019! 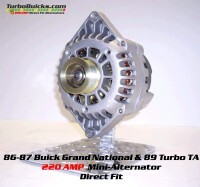 TurboBuicks.com Introduces 220AMP Mini-Alternators! 4lbs lighter than the stock 120AMP alternator! This is the internal CS130D style alternator built specifically for the '86-'87 Turbo Buicks and '89 Turbo Trans Am cars! NEW FOR 2019! TurboBuicks.com 120AMP Stock Appearing Alternators! 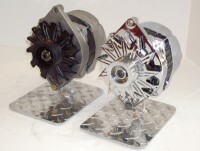 TurboBuicks.com now provides stock appearing 120AMP alternators for the '86 - '87 Buick Grand National, Turbo-T, T-Type and 1989 Turbo Trans Am. These units are 100% BRAND NEW! Beware of low quality, remanufactured alternators from your local parts store. NEW FOR 2019! Our TurboBuicks.com Mini-Starters are now available in CHROME! 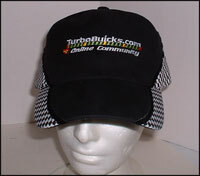 Save $3 on this Hat/Shirt combo and look cool at the same time! Provided exclusively by TurboBuicks.com, these 'Torque Spec' sheets are invaluable when it comes time to assemble your Buick V6 Turbo powerplant. Support our web site by ordering your very own laminated TurboBuicks.com Torque Specs Sheet today!